The MacMillin Co. Inc. was recently cited by inspectors with the Occupational Safety and Health Administration (OSHA) for failing to help ensure worker safety and for failing to protect employees from a work accident in New England. The worst thing about these citations is that the violations were discovered after an investigation that was warranted following a fatal work accident in September. The fatal work accident happened at the company’s construction site at Keene Middle School. What happened is that temporary workers were doing their jobs under the direction of the Keene-based contractor when a plank on the erecting scaffold they were working on snapped. One of the workers on that scaffold fell nearly 30 feet to the concrete floor below. He died from injuries sustained in the fall. After the fatal accident, OSHA inspectors took a peek at the construction site and discovered that the scaffold hadn’t been previously inspected for defects, workers had not been provided with the proper training to be working with the equipment and the company didn’t make sure that the employees were provided with or were using proper fall protection equipment. With these willful violations, the company received three violations. A company is cited for these conditions when an employer is determined to have total disregard for federal safety requirements and fails to keep workers safe and healthy. Our Massachusetts workers compensation lawyers understand that wasn’t all — the company was doing a lot more to jeopardize its workers’ safety. OSHA also determined that the scaffold planks that they were working on were not designed to support such heavy loads, the legs of the scaffolds were not set on base plants, the planks of the scaffolds were not covered with paint and the workers weren’t even being supervised when the scaffold was erected. These additional citations landed the company with four serious violations. Serious violations occur when there is a high probability for serious injury or death from a danger that an employer should have known about. “Proper planning, inspection procedures, employee training and equipment could have prevented this incident and the worker’s death that resulted,” said Rosemarie Ohar, an OSHA area director. 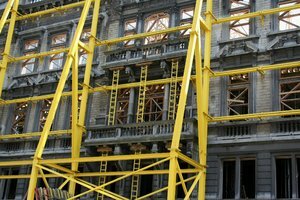 Ohar adds that employers who use scaffolds in their duties should take the time and make the effort to look over and inspect their equipment, their employees’ training and the company’s work practices to help ensure that risks for accidents are minimized. These recommendations are in fact federal regulations and are designed to help protect workers throughout the U.S. It is a legal obligation to reduce dangers on work sites, regardless of the industry. All of these violations and citations left the company with nearly $200,000 in proposed fines. Nearly 2.5 million construction workers in the U.S. work on scaffolds. That’s nearly 70 percent of the construction industry. Scaffolding accidents kill nearly 100 workers and injure nearly 5,000 every year. The Law Offices of Jeffrey S. Glassman LLC is a group of experienced and knowledgeable workers’ compensation attorneys who are dedicated to fighting for the rights of employees who have been injured on the job in Boston and elsewhere throughout the state of Massachusetts. Call 1-877-617-5333 to set up a free consultation.